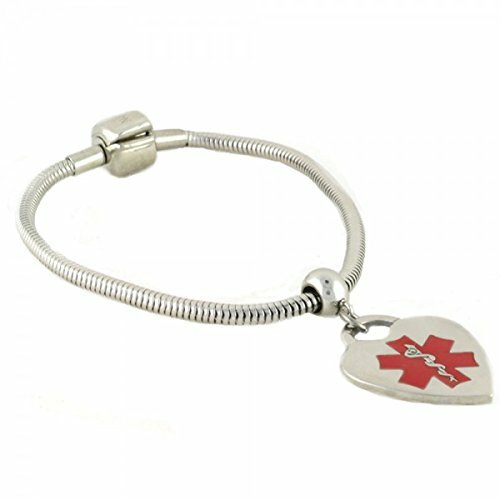 Looking to spruce up your style with a unique and functional stainless steel medical charm bracelet? Here is the perfect starter bracelet for those of you who would like to build your own beaded bracelet using interchangeable beads from popular bead companies. We recommend adding your gripper bead to the end of the chain next to the clasp to keep your beads in place when removing the bracelet. Bracelet comes PRE-ENGRAVED with "ON BLOOD THINNER"! Endless design possibilities. Easily add your own beads from popular bead companies. Medical charm is PRE-ENGRAVED with "ON BLOOD THINNER"
Stainless steel snake chain design. The charm is ¾" Heart. If you have any questions about this product by N-Style ID, contact us by completing and submitting the form below. If you are looking for a specif part number, please include it with your message.